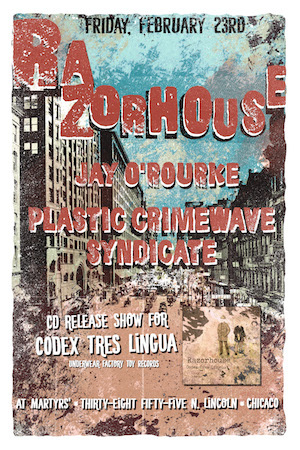 Razorhouse’s new EP, Codex Tres Lingua, is now out The band will be celebrating the release on Fri, Feb 23 at Martyrs’. Don't miss this. Chicago’s Razorhouse is the brainchild of Mark Panick (Bonemen of Barumba) and his cohorts, longtime percussionist David Suycott (Robert Pollard, Machines of Loving Grace), guitarist Tommi Zender, bassist Jim DeMonte (Insiders, Marquis) and mixing engineer Howie Beno (Ministry, Depeche Mode, Blondie). Codex Tres Lingua is Razorhouse's 3rd EP out on Underwear Factory Toy Records. Like a zealous tent revival rolling back into town, Mark Panick’s post-Bonemen of Barumba project, Razorhouse, returns with Codex Tres Lingua to be released on Tuesday, February 6, 2018, on Underwear Factory Toy Records. The songs on Codex Tres Lingua are sewn through with literary dark thread while brimming with cinematic art-punk. The record is filled with love-torn riches mired in muck and is a grand statement from a compassionate punk. Razorhouse is the brainchild of Mark Panick (Bonemen of Barumba, Chac Mool, Black Friars Social Club) and his cohorts, longtime percussionist David Suycott (Robert Pollard, Machines of Loving Grace), guitarist Tommi Zender, bassist Jim DeMonte (Insiders, Marquis) and mixing engineer Howie Beno (Ministry, Depeche Mode, Blondie). Panick is known for his inroads in art-punk and weird-core, Razorhouse is a new angle on the same throbbing dark underbelly of the human condition. Only this time it is conjured into a stew that comes out sounding like some twisted American songbook. For those who want their pop music to come from the red light district, and those who want their nightmares to have a lush and memorable soundtrack, there is Razorhouse. 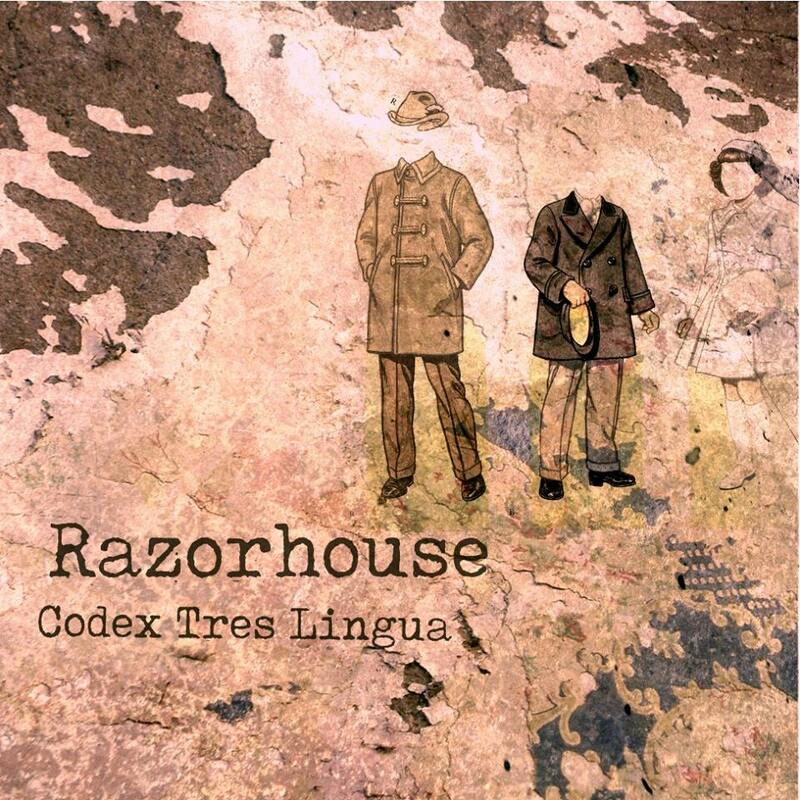 On Codex Tres Lingua, Razorhouse simultaneously looks back wistfully, covering the 1981 Bonemen of Barumba song “Walking With The Deadmen” (a Joy Division-meets-Cramps track and Jon Peel favorite) and aggressively traverses alien territory with the soulful, Americana-tinged “Cut Me Low.” In “Across the Wire,” the EP’s 5th track, Panick and Nora O’Connor (The Flat Five, Mavis Staples, Andrew Bird, Neko Case) weave together verses thick with imagery. Throughout the EP’s five tracks, there’s a stylistic breath and diversity that the band embraces while keeping a foothold in their dark-hued world. That is the magic of Razorhouse: they draw us into to their strange territory and show us what it is like to go walking with the deadmen. Like a zealous tent revival rolling back into town, Mark Panick’s post-Bonemen of Barumba project, Razorhouse, returns with Codex Tres Lingua to be released on Tuesday, February 6, 2018, on Underwear Factory Toy Records. The songs on Codex Tres Lingua are sewn through with literary dark thread while brimming with cinematic art-punk. The record is filled with love-torn riches mired in muck and is a grand statement from a compassionate punk.Razorhouse is the brainchild of Mark Panick (Bonemen of Barumba, Chac Mool, Black Friars Social Club) and his cohorts, longtime percussionist David Suycott (Robert Pollard, Machines of Loving Grace), guitarist Tommi Zender, bassist Jim DeMonte (Insiders, Marquis) and mixing engineer Howie Beno (Ministry, Depeche Mode, Blondie). Panick is known for his inroads in art-punk and weird-core, Razorhouse is a new angle on the same throbbing dark underbelly of the human condition. Only this time it is conjured into a stew that comes out sounding like some twisted American songbook. For those who want their pop music to come from the red light district, and those who want their nightmares to have a lush and memorable soundtrack, there is Razorhouse. On Codex Tres Lingua, Razorhouse simultaneously looks back wistfully, covering the 1981 Bonemen of Barumba song “Walking With The Deadmen” (a Joy Division-meets-Cramps track and Jon Peel favorite) and aggressively traverses alien territory with the soulful, Americana-tinged “Cut Me Low.” In “Across the Wire,” the EP’s 5th track, Panick and Nora O’Connor (The Flat Five, Mavis Staples, Andrew Bird, Neko Case) weave together verses thick with imagery. Throughout the EP’s five tracks, there’s a stylistic breath and diversity that the band embraces while keeping a foothold in their dark-hued world. That is the magic of Razorhouse: they draw us into to their strange territory and show us what it is like to go walking with the deadmen. Jay O’Rourke began his professional music career working in Chicago’s Clubs in the 1980’s. His first record release was as a co-producer of Ministry’s first Wax Trax release “I’m Falling/Cold Life”. Jay went on to produce & play guitar for Chicago legends “B.B. Spin”.Following stints as front of house engineer at The Vic Theater & The Park West (in Chicago), Jay produced & played guitar for “The Insiders” Epic Records debut “Ghost On The Beach”. The record charted in the top 10 at Rock Radio. The Insiders went on to release 3 more records on Jay & Ginny O’Rourke’s, Monsterdisc Records.O’Rourke was mastering engineer for Alligator Records at Monsterdisc Mastering, engineering over 20 releases for the label. He has worked with artists as diverse as Warren Zevon, Urge Overkill, Robbie Fulks, Material Issue, Liz Phair, & The Slammin’ Watusis.Jay’s last band, “The Lucky 3 Blues Band”, was a top opening act at venues like Mayne Stage, Buddy Guy’s Legends, House of Blues, Space, & The City Winery Chicago. Jay produced two CDs for the band, which gathered airplay on hundreds of blues stations around the world.Jay went into the studio, and started writing and recording what is now his solo guitar/rock debut. This is the first record featuring Jay on vocals. In 2017 Jay recorded a CD of guitar/rock based songs called TWENTY SIXTEEN. Plastic Crimewave Syndicate features members of Plastic Crimewave Sound, Moonrises, Strychnine, Bionic Cavemen, Great Society Mind Destroyers, and Rabble Rabble.